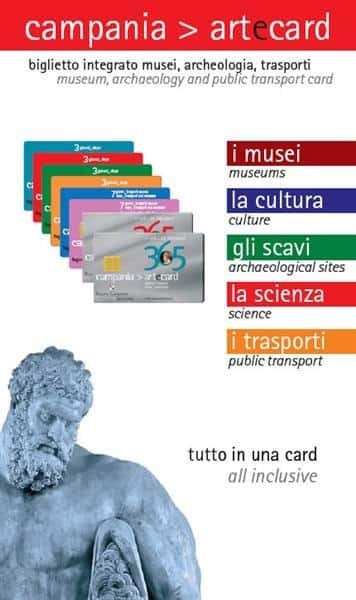 Campania Artecard, an integrated museum-transport system, invented in 2002 by the Regione Campania and coordinated by Scabec, was born with the objective of valorising the cultural heritage of the region through a card that would facilitate the visitor in his itinerary. Campania Arte Card offers an all inclusive, extremely advantageous, one stop card, that includes admission tickets to the main museums and archaeological sites of the Region, free travel on the local public transport system, whilst allowing the holder to take advantage of numerous discounts for other dedicated services in the area. Campania Artecard is an inclusive ticket that allows queue free access to the main museums and archaeological areas of the Region. In detail, you can visit the sites in the Artecard circuit, obtaining discounts and special offers for the other places and services connected to the circuit. Furthermore, for some card types the Campania artecard offer is inclusive of local public transport.